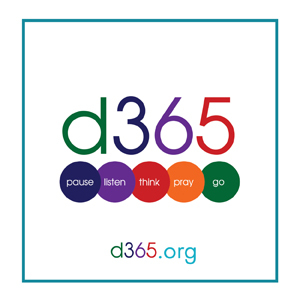 At the end of 2013 I was invited to write a week’s worth of devotions on a site called d365.org, which is a partnership between the Presbyterian Church USA, the Cooperative Baptist Fellowship, and the Episcopal Church. Produced by Passport Inc. (a national non-profit whose goal is to work for integrated, ecumenical, inspirational weeks of summer camp that model important lessons like service in the name of Christ), its first devotional site was launched in 2001 in response to the attacks of September 11. Their primary goal then, and since, has been to provide inspirational and relevant reflections on scripture for young people (teens and young adults). The site involves some music for centering, a reading from scripture, a brief devotion, a prayer, and a sending forth. You can sign up to have it pop in your in-box every day and is a great resource to share with your youth (or adults). It was a great challenge for me. Reflecting verse by verse, each on its own while also looking at the big picture and the themes that resonated with me. In fifty words. Today my last reflection was posted on the site, so I thought it appropriate to share in its entirety. You can read each of them in context on d365.org’s archives page. (March 16-22, 2014). So, grab your bible (or click on the link that will take you to the online NRSV verses) and read about Nicodemus, light, transformation, and righteousness! Pause: The world is changing. When time passes between meetings, you see that friends and family are changing too. And you are changing as well. In these next moments, open your heart to God, who is seeking more than change in you, but transformation—something truly new. Think: When the electricity goes out at night my immediate reaction is to light a candle and find a flashlight. My eyes (and mind) are accustomed to seeing by artificial light when the sun goes down, so it takes awhile for my pupils to open up wide, strain, and focus on finding my way, even in familiar surroundings. The darkness reminds me of the power of light to see things known and unknown. Not so with Nicodemus. He hides in the shadows. As one who knows much (after all, he is a Pharisee), he still seeks answers. He comes to see Jesus under cover of night, but the deeper darkness of unbelief obscures his vision. He cannot recognize a new vision of what life can be; he seems stuck on what life just is. Jesus is the light of the word – daytime and nighttime. He meets us in the shadows as well as the sunshine. How does Jesus show you the way whenever you are in the midst of darkness or overcome by shadow? Pray: Lord, teach me to trust you in the darkness and recognize the signs that you give me to light the way. Help me to be open to new possibilities, new experiences, and new awakenings so that I can be a sign to others of your amazing love for the world. Amen. Think: Literally, I can’t imagine being born again. But spiritually, yes. I was welcomed into the family of God on my baptism when I was four months old, being “marked as Christ’s own forever.” I don’t remember it, but I do remember my confirmation many years later when I renewed by commitment to follow Jesus. The gift of faith that came from my parents and godparents, from those who surround me in love, and from the Holy Spirit continues to bless me and spur me on to be the best that I can be. Nicodemus is a literal thinker. He is focused on the flesh of birth, like a newborn baby coming into the world. But Jesus is speaking of being born from above – born to live a life in a new way – open to the Spirit in a new creation. I have a friend who, when she takes a shower, thinks about the water flowing over her as a re-baptism to a new day, a new beginning. Being born again is awakening to the grace and knowledge of God’s presence in her life. Each new day offers opportunities to begin life anew. How does God call you to new life? Pray: Holy Spirit, wash over me. Fill my heart with a renewed sense to follow Jesus today and every day, for I yearn to be live my life following God’s way instead of my ways. Amen. Think: I used to camp as a Girl Scout. Building a campfire was fun, but with it came a great deal of responsibility. Whenever we left the campsite, we had to make sure the fire was completely out. After breakfast one day we left for a hike only to return to the site for lunch to see that the fire had reignited. It was a windy day, and a gust of wind had sparked the dying embers, bursting the charred wood back to life. We had no idea the wind would make an appearance in our absence. There’s a word in Greek, pneuma, which means both “spirit” and “wind.” When Jesus speaks of rebirth and new life, he is speaking of the elusive and mysterious power of the Spirit. There’s no telling when it will come or to whom (or what) it will descend upon. Being born again isn’t something we can do; it happens through the power of the Holy Spirit. When have you experienced the unexpected power of the Spirit? Pray: Spirit of God, blow your wind upon me. Create in me new sparks to proclaim the Good News of Jesus in my words and actions. Amen. Think: Struggling with questions can be important in helping in strengthening and defining faith. Yet when I’m resistant or reluctant, or simply in the wrong place to see clearly, I sometimes ask questions to help avoid the real issues that is facing me. When I’m confused, it is easy to fall back to taking things literally. It’s easy to get stuck. Kind of like Nicodemus – he seems to want an answer from Jesus that can be wrapped up in a few words or actions. The known and the unknown things of life call me to look beyond my surroundings and myself. The world of the Spirit is beyond my (and Nicodemus’) comprehension. It challenges me. It encourages me to question, to seek, to learn more. It challenged Nicodemus, too. Jesus turned the world upside down; he is asking us to look toward heaven instead of having our heads stuck in worldly thoughts. Knowing and believing can walk side-by-side if I have faith. How can you imagine heavenly things? Pray: Lord, as I journey toward Jerusalem with you, help me to stay with you through the challenges that lie ahead. Keep me looking heavenward instead of focusing on the little pebbles along the path. Open up my imagination. Amen. John 3:16 used to be seen at sporting events on a sign held up by a man in the crowd. Today it could be a Gospel message “tweet” with just 131 characters. We have the promise that Jesus, the Son of God, came to bring light and life to the world. That seems enough to broadcast to the world. Pray: God, thank you for the promise of eternal life. Thank you for loving us so much you became one of us and died to new life for us. Give us strength to stand with you at the cross so we may rejoice with you in your resurrection. Amen. Think: What does it mean to be righteous? By definition, it is a person who is virtuous in their conduct and morally right. When I think of Abraham, I think of his relationship with God. Abraham gave his whole heart and confidence to God. His obedient trust led him on a journey into the unknown. His faith counted on God for everything. And God remained with him – even when he doubted along the way. Relationships are two-way streets; each person needs to be open and receptive to listen to the other. It isn’t always sunshine and roses, but often involves give and take, compromise, and forgiveness when things break down. This is the gift God gave the world through his Son, Jesus. We don’t have to prove anything for God to love us. God does ask that we follow in the ways of those who obeyed as best they could, despite their human weaknesses – people like Abraham and David. God calls me to righteousness, and loves me no matter what. Pray: Help me give my heart to you, O God. Give me the strength to put all my trust in you. Clear my doubts. Show me the ways to be righteous in your sight on my life’s journey. Amen. Think: The Hebrew root word translated “keep” means to guard, to protect, to take care of someone or something. It implies looking out for someone else’s best interests, keeping another from harm or injury, watching out for his or her welfare. In order to “keep” someone in this way you must pay attention. You have to intentionally regard the other seriously, personally, continually. You have to care. God cared for Abraham. God cared for Nicodemus. God cared for Jesus. God cares for me. Faith is living like you are God’s person. Faith is living your life trusting God every day. Faith includes living by God’s rules and trusting God to love you and forgive you when you mess up. Faith means living like Jesus. God is my keeper – in a good way. God keeps me in God’s constant sight, protecting me always. God keeps me from evil. God keeps me surrounded by care and provision when I am awake and while I sleep. Pray: Lord, you watch over my comings and goings. With the decisions I make, keep me safe. Watch over those I love. Help me to care for others as much as you care for me. Amen. A new birth by the power of the Spirit. Leading towards a life of righteousness. God’s steadfast care will provide.